Another study, published in Alcoholism: Clinical & Experimental Research last week, is another in a long list of research that links childhood trauma to addiction, says psychiatrist David Sack. 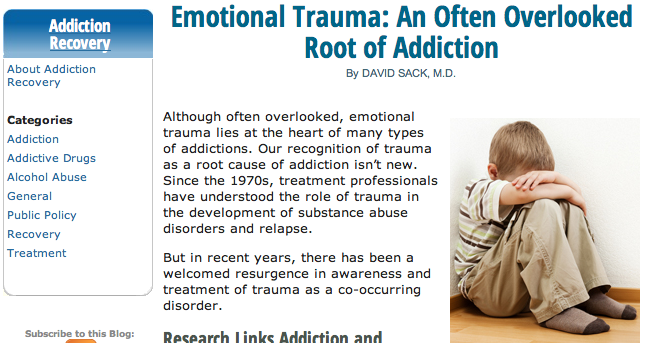 In his blog on PsychCentral.com, Sack says that therapists who are treating addiction should also treat a person’s trauma. He cites the CDC’s ACE Study, and the finding that “chronic recurrent humiliation” — emotional abuse — is one of the most destructive forms of trauma. Whereas the general population has physical abuse rates of 8.4 percent, the rate for alcoholics has been reported at 24 percent for men and 33 percent for women. The rate of sexual abuse in the general population hovers around 6 percent, while the rate for alcoholics has been reported at 12 percent for men and 49 percent for women. critical to the continuation of 21 essential N.H. programs in law enforcement, prosecution, courts, and victim service agencies, including the Domestic Violence Units in the Manchester, Nashua and Portsmouth police departments, domestic violence prosecutors, and victim advocates in county attorney offices and police departments, emergency legal services for victims, the N.H. Sexual Assault Nurse Examiner Program, and Supervised Visitation and Safe Exchange Centers for children. Last year, he noted, the crisis centers in New Hampshire served 11,052 victims of domestic and sexual violence and 743 victims of stalking.